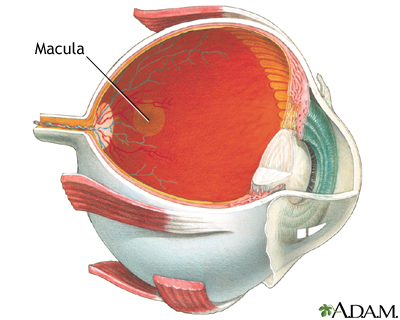 When an eye is looking directly at an object, light rays from that object are focused on the macula lutea. This is a yellow oval spot at the center of the retina (back of the eye). It is the part of the retina that is responsible for sharp, detailed central vision (also called visual acuity). The macula lutea, also called fovea, contains a very high concentration of cones. These are the light-sensitive cells in the retina that give detailed central vision. Chin EK, Pilli S, Nguyen DH, et al. The anatomy and cell biology of the retina. In: Tasman W, Jaeger EA, eds. Duane's Foundations of Clinical Ophthalmology. Philadelphia, PA: Lippincott Williams & Wilkins; 2013:chap 19. Franklin W. Lusby, MD, ophthalmologist, Lusby Vision Institute, La Jolla, CA. Also reviewed by David Zieve, MD, MHA, Isla Ogilvie, PhD, and the A.D.A.M. Editorial team.